Page 5 of Panama Photos. Last updated: 8/23/10. 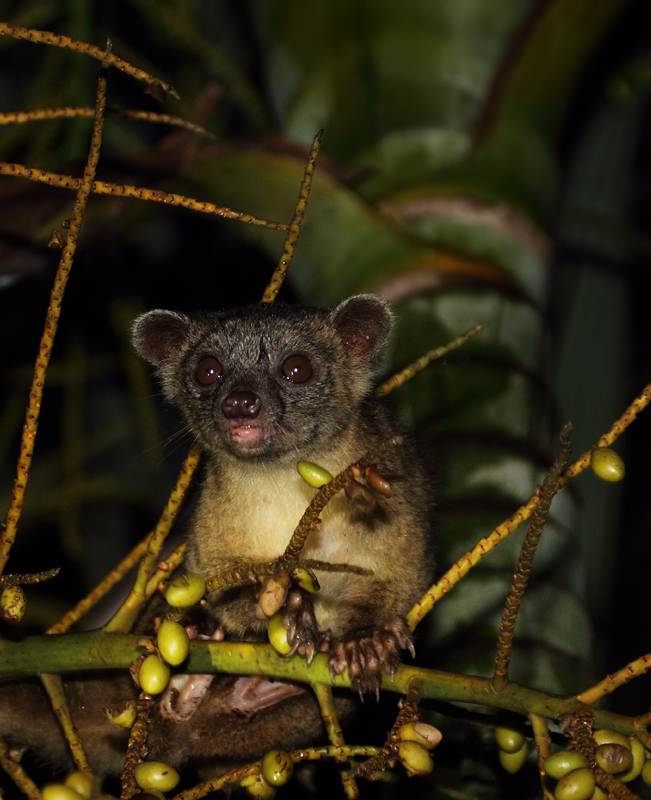 Above and below: This delightful creature, an Olingo, was willing to approach our huts in Nusagandi, Panama to take advantage of an abundance of palm fruit. 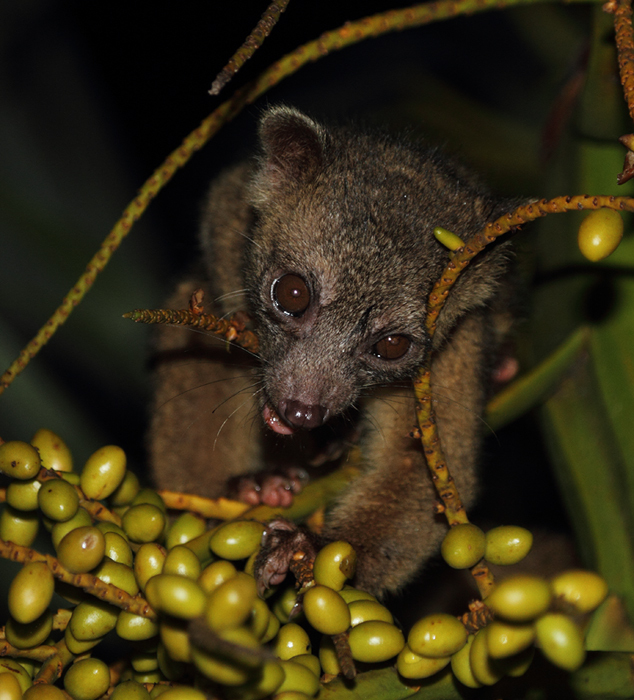 Below: When the lodge's vehicle returned in the late evening, the Olingo ran to the edge of the tree to investigate. 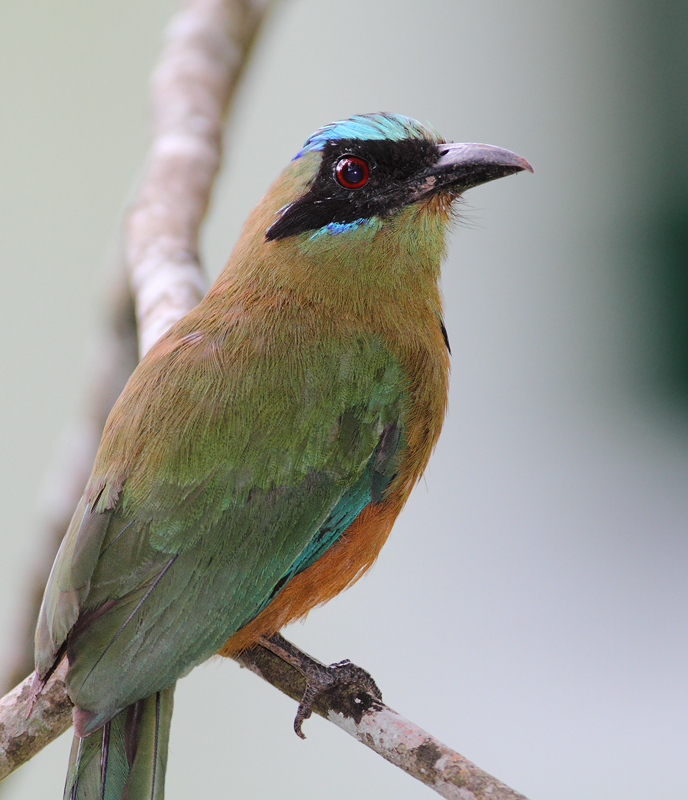 Below: A Whooping Motmot (split from Blue-crowned Motmot) poses in the town of Gamboa, Panama (Aug 2010). 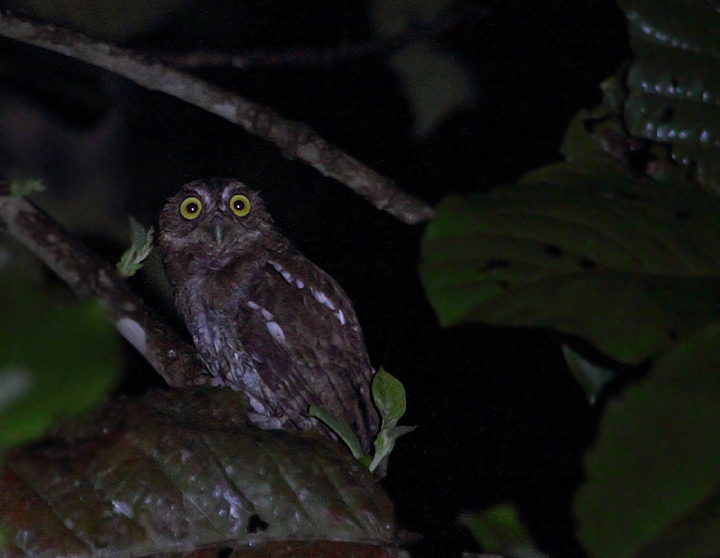 Below: The short trills of the local subspecies of Vermiculated Screech-Owl were common in the foothills around Nusagandi, Panama (August 2010). 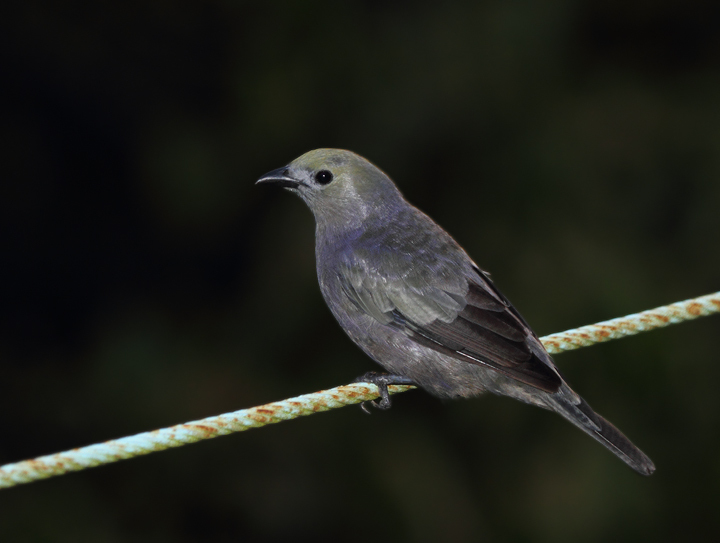 This individual was calling spontaneously, but flew in quickly to whistled imitations. 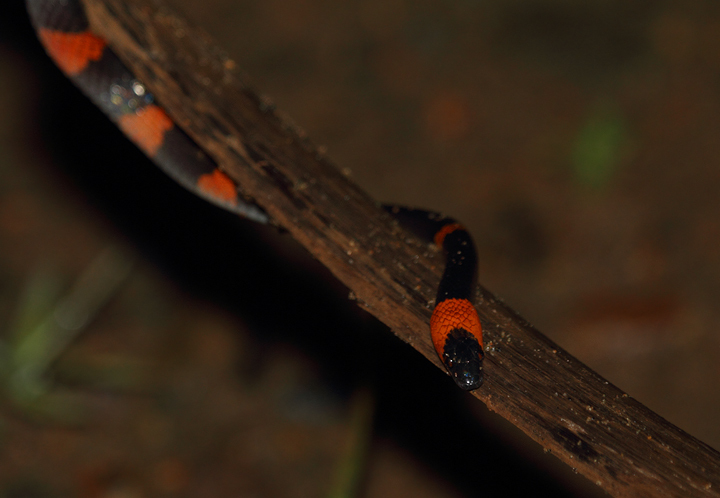 Below: A False Coral Snake (Oxyrhopus petola) found at night in eastern Panama. 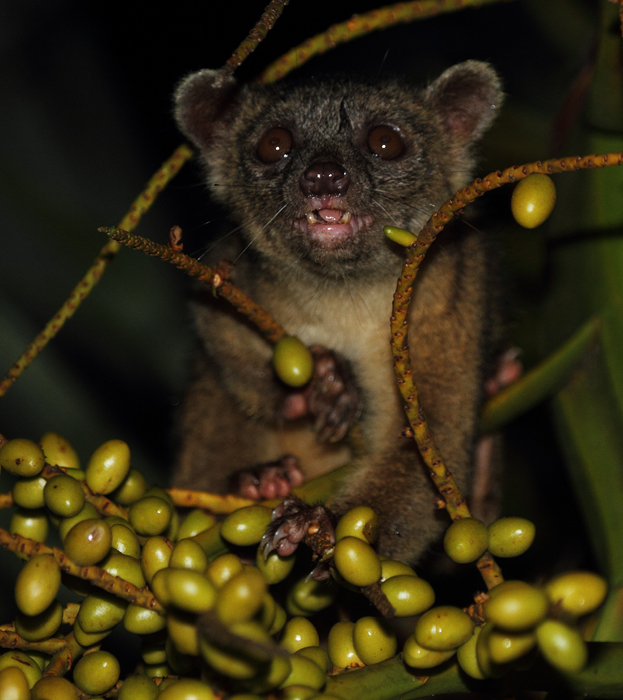 The large eyes are the biggest clue that we are dealing with a non-venomous species, though not catching that in the field made this an exciting encounter. 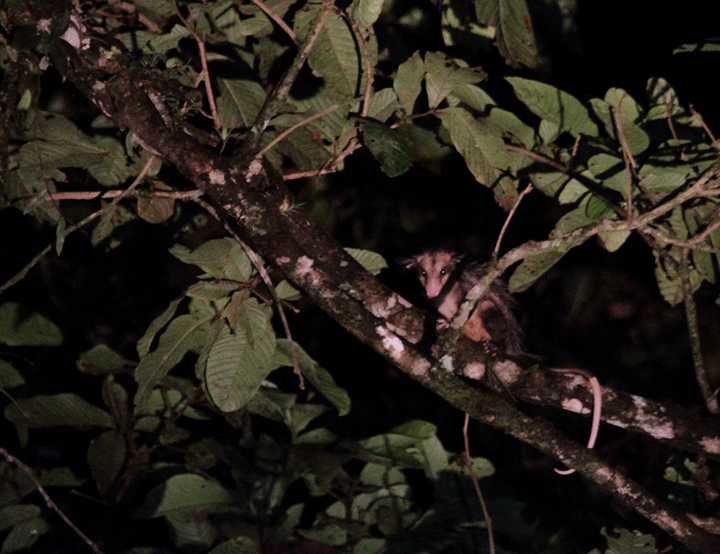 Below: A Common Opossum found on a night outing in the Nusagandi area of Panama (August 2010). 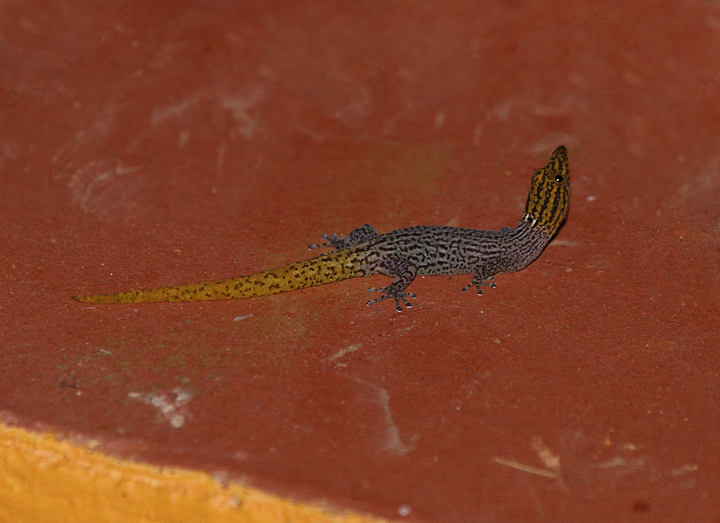 Below: Easily my new favorite gecko in the world, the impossibly beautiful Sphaerodactylus homolepis - eastern Panama (August 2010). 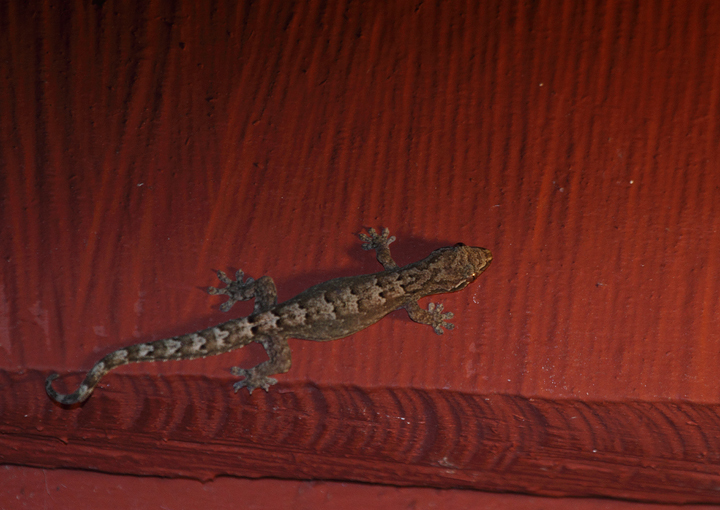 Below: A presumed Turnip-tailed Gecko (with less obvious namesake tail) (Thecadactylus rapicauda) in eastern Panama (August 2010). 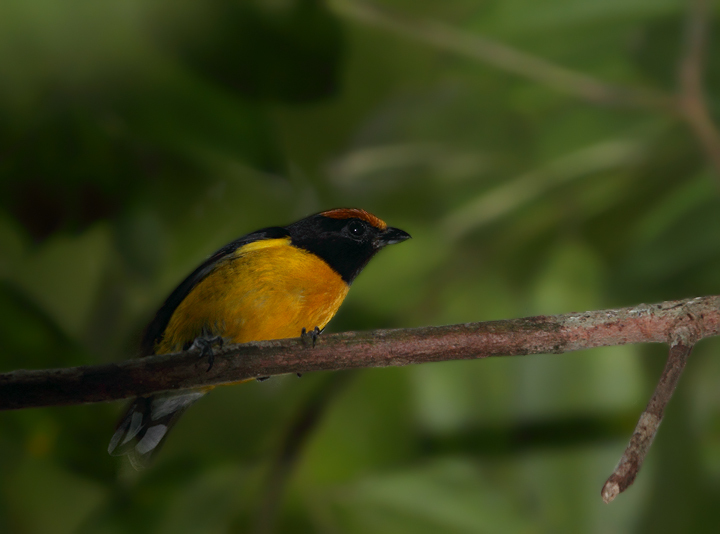 Below: This beautiful Tawny-capped Euphonia landed just overhead in the rainforest at Nusagandi, obviously curious at our passing. 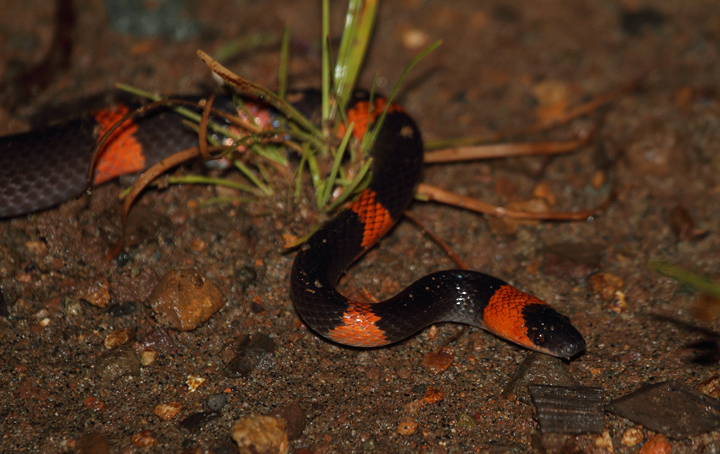 Below: A Common Pauraque, common in the foothills near Nusagandi, allows a short photo shoot at the roadside (August 2010). 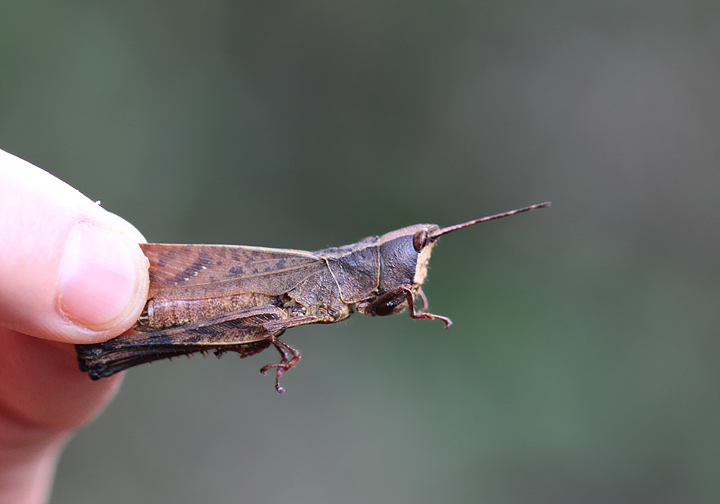 Below: A grasshopper species (similar to our toothpick grasshoppers) in eastern Panama (August 2010). 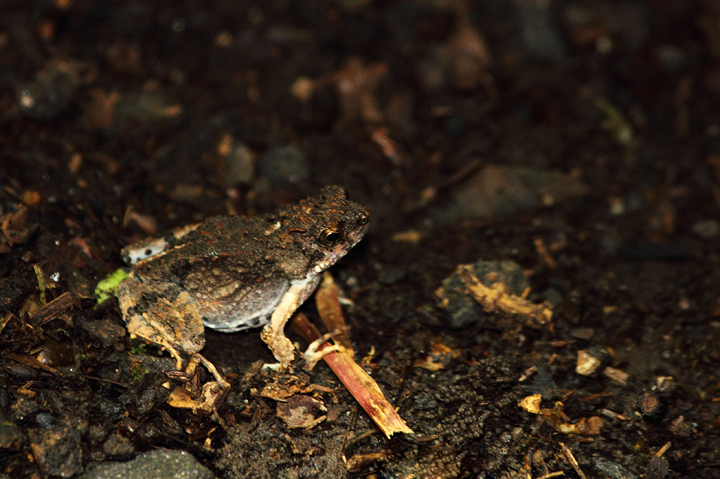 Below: A Litter Toad (Bufo typhonius) in the Nusagandi area of Panama (August 2010). 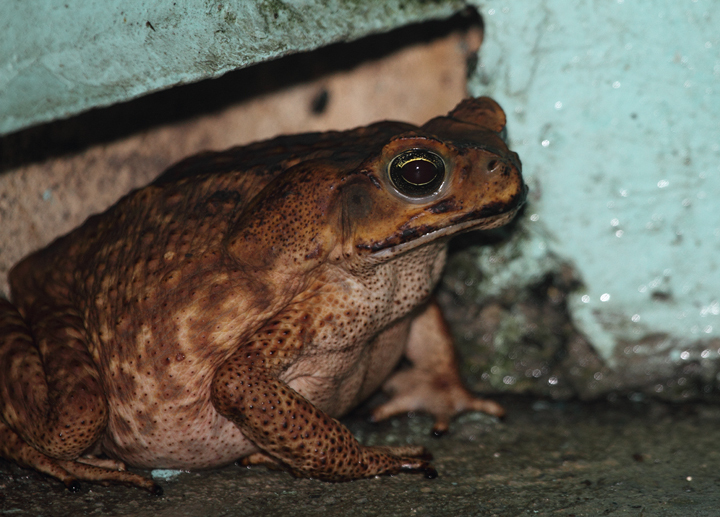 Below: The enormous Marine Toad (aka Cane Toad) was common around Gamboa, Panama (August 2010). 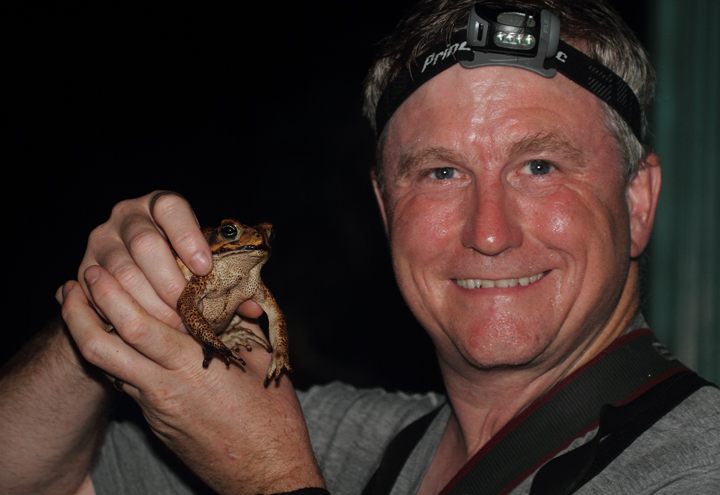 My friend Tom Feild poses for scale in one of our nightly walks. 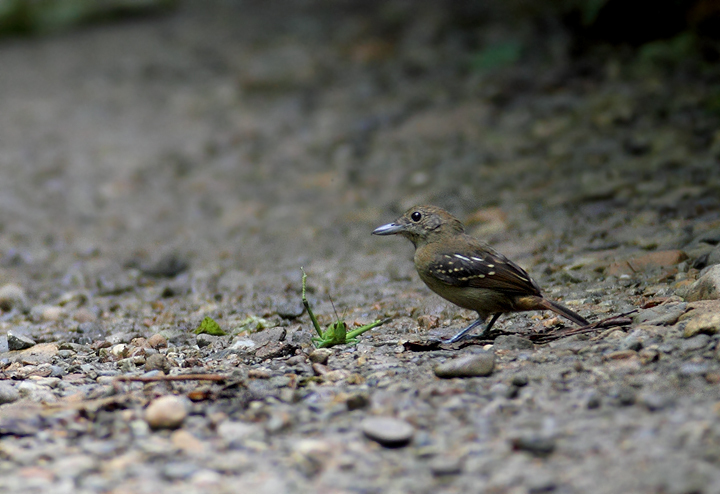 Below: A female Western Slaty-Antshrike executes a successful attack run on Pipeline Road, Panama (August 2010). 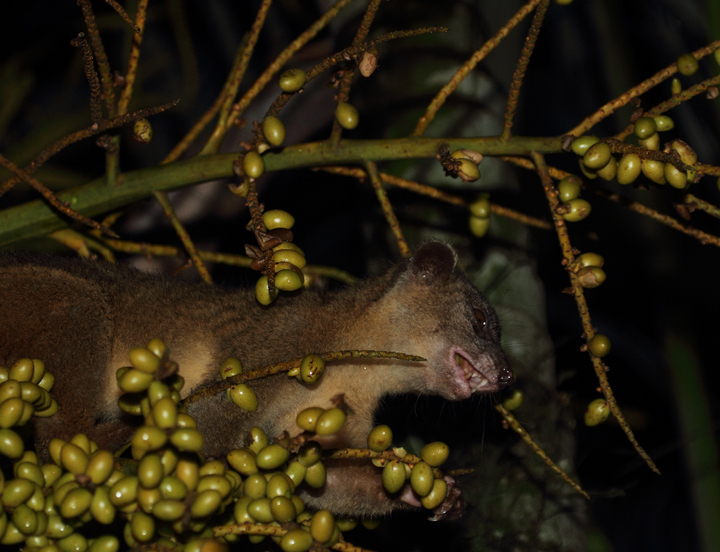 Below: Climbing toward the sun in eastern Panama (August 2010). 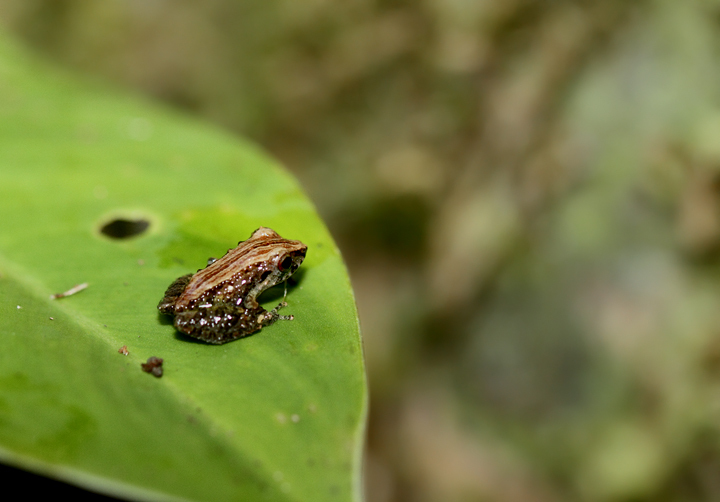 Below: A delicate frog species in the Nusagandi area of Panama (August 2010). 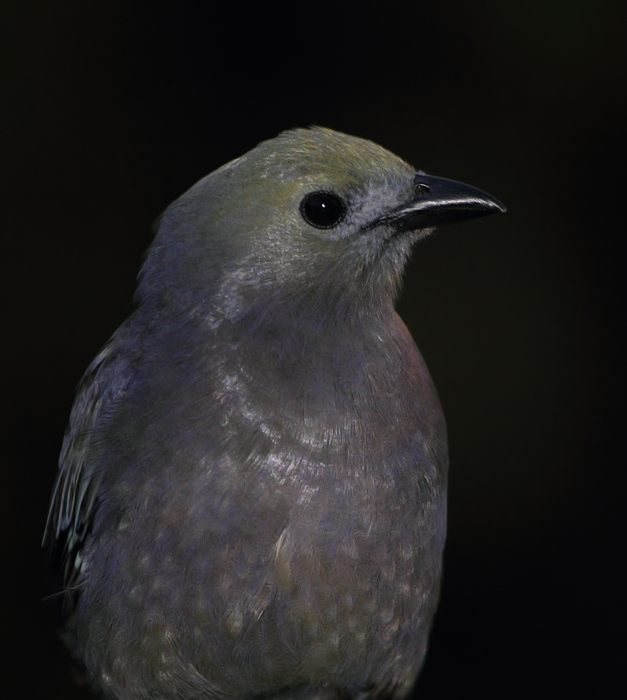 I'm still working on this ID. 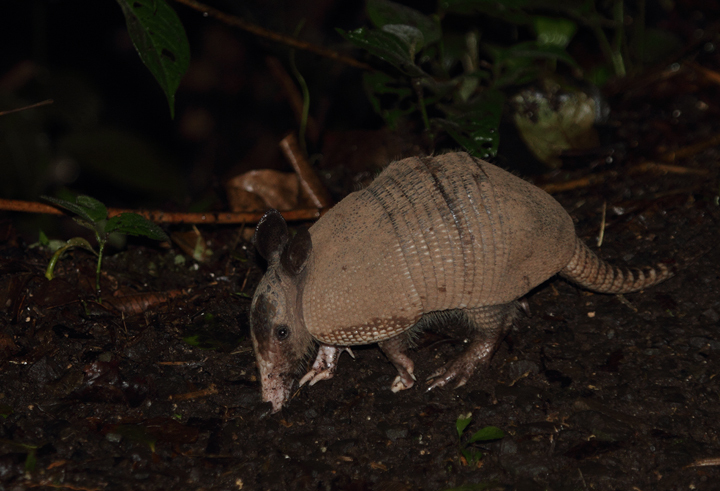 Below: This Nine-banded Armadillo was so preoccupied in its roadside foraging that it approached quite closely before noticing us. 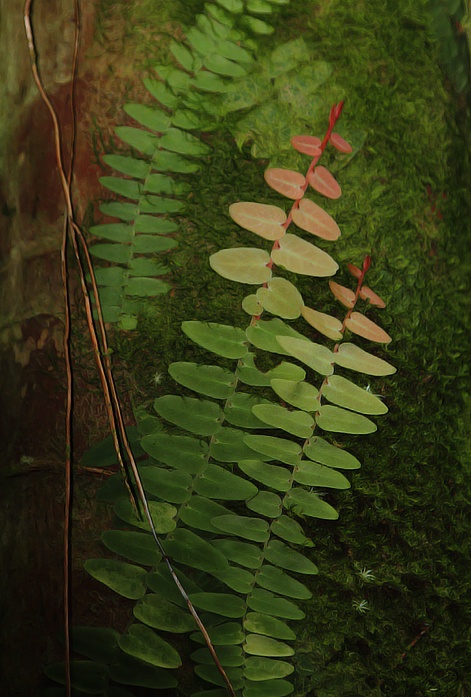 I was crouched down quietly 8' away before it looked up and ran into the forest (Gamboa area, August 2010). 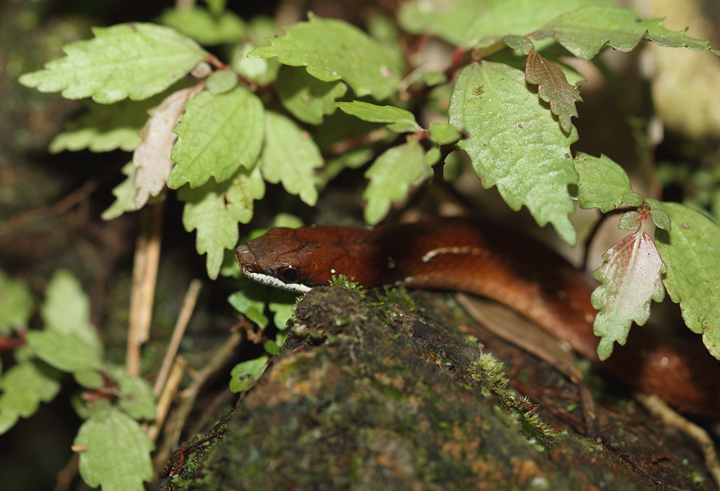 Below: Spotting this beautiful and terrifying creature while walking in a remote streambed was a moment I won't forget. 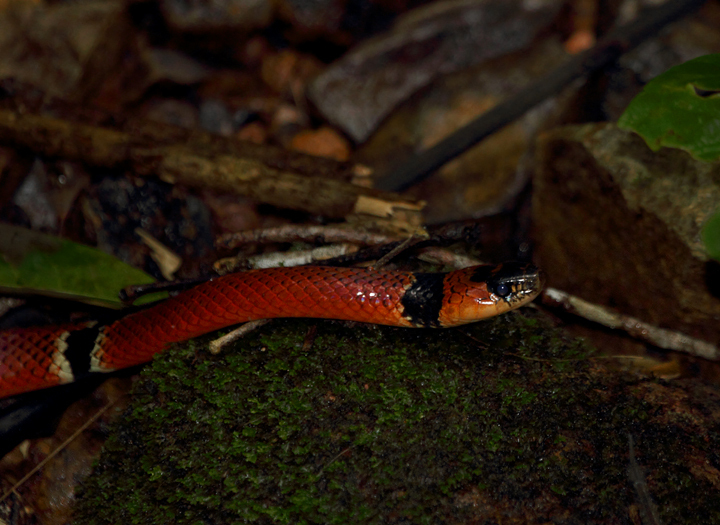 Presumably one of the coral snake mimics based on broken rings and seemingly large eye, it is quite similar to Central American Coral Snake (Micrurus nigrocinctus). 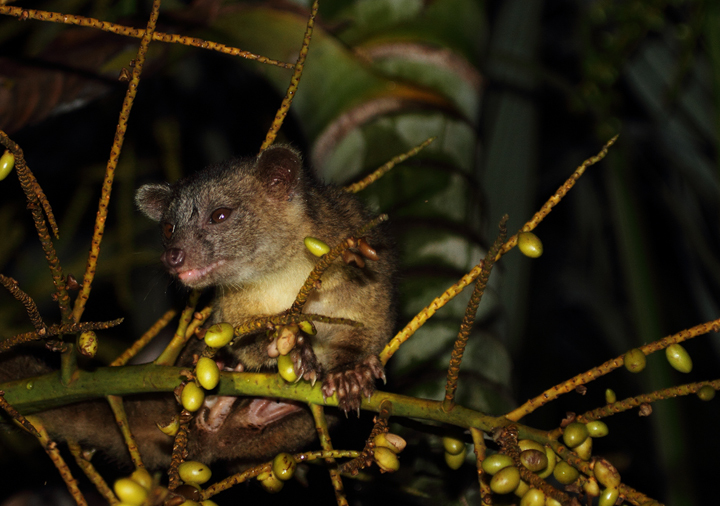 Note its companion on the rock. 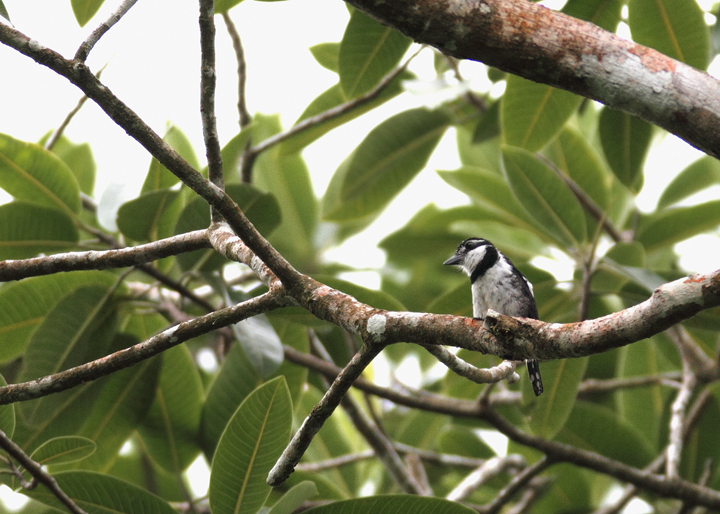 Below: The Pied Puffbird is the smallest of the local puffbirds. 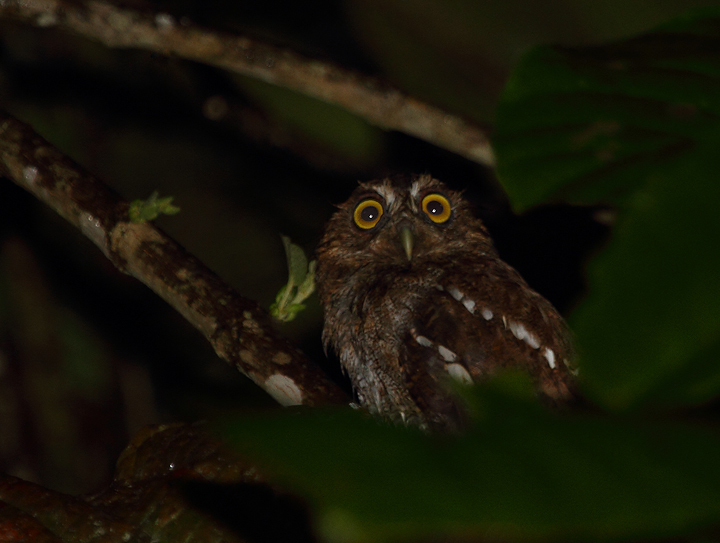 At least one local birder nicknamed it "Puffito" (slang for little puffbird). 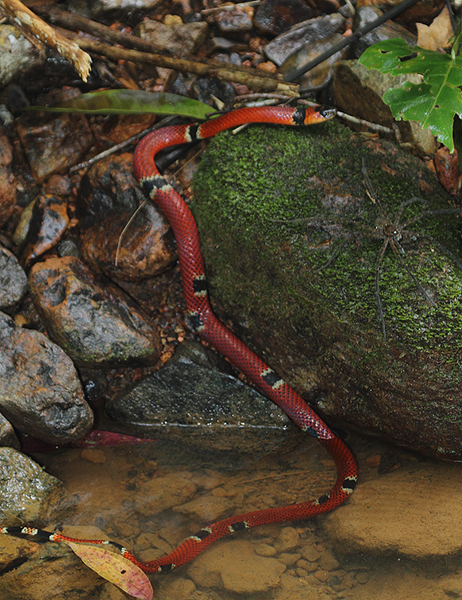 (Gamboa area, Panama, August 2010). 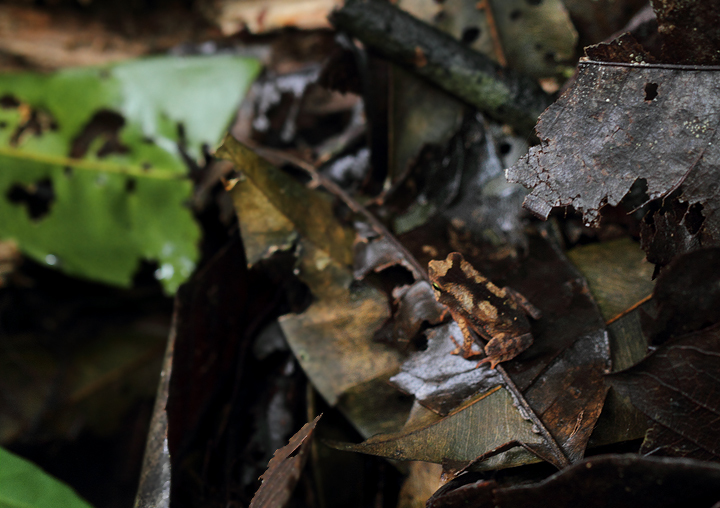 Below: The calls of the Tungara Frog (Engystomops pustulosus) were one of my favorite sounds of the Panamanian rainforest (August 2010). 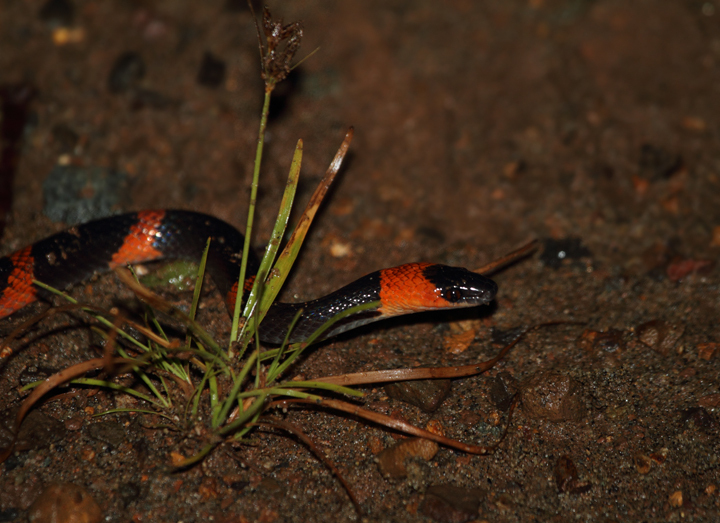 Displaying males find a hollow area and boom their explosive "Tooong!" calls. 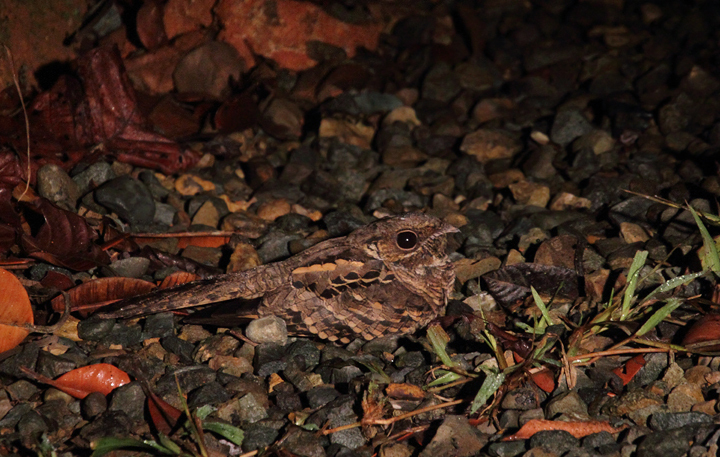 This will be among the many sound recordings I post when I catch up on photos (someday!). 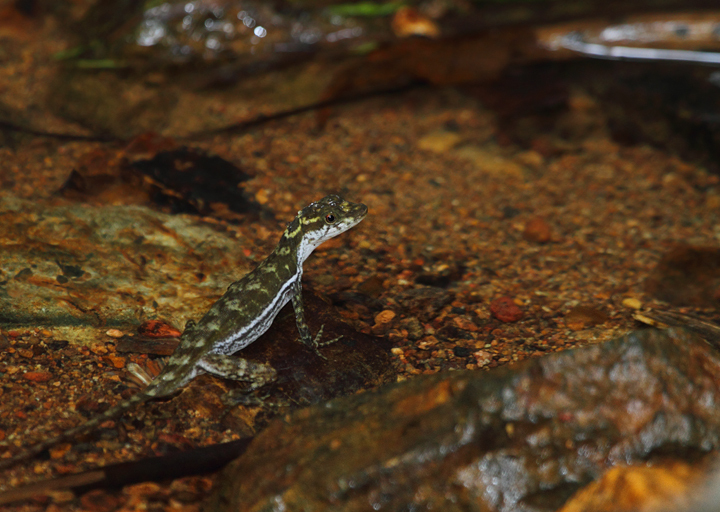 Below: A Water Anole (Anolis aquaticus) in eastern Panama (August 2010). 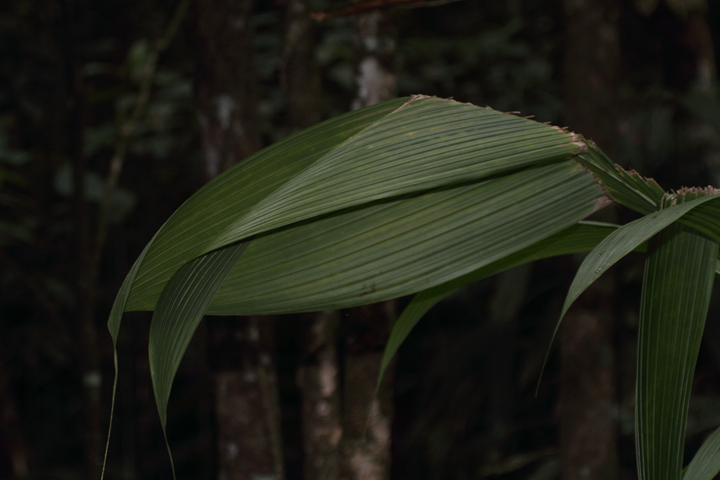 Below: A distinctive seam in this palm leaf betrays the presence of its industrious residents. 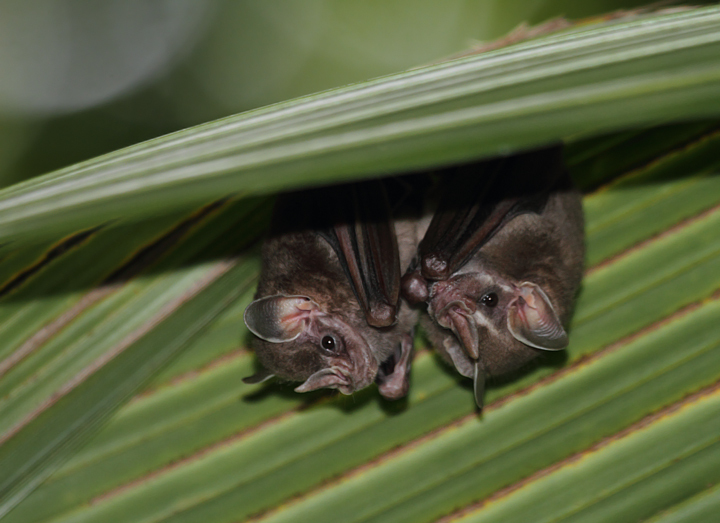 Below: Common Tent-making Bats carefully bite large palm leaves to create a dry and comfortable roost in the rainforest (Nusagandi, Panama, August 2010).